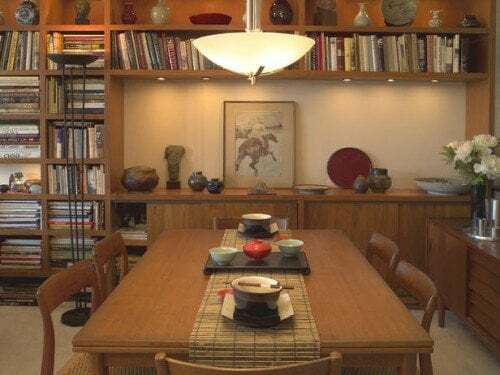 Good dining room design should include space for a dining room hutch or sideboard for some other kind of dining room storage that is attractive, efficient and easy to access. The purpose of a hutch, sideboard or buffet is to provide extra storage for your best dishes, flatware, and linens when guests come to visit and also provides a serving area for placing food and table accents. There are too many styles, shapes and even eras to cover when looking at dining room storage. 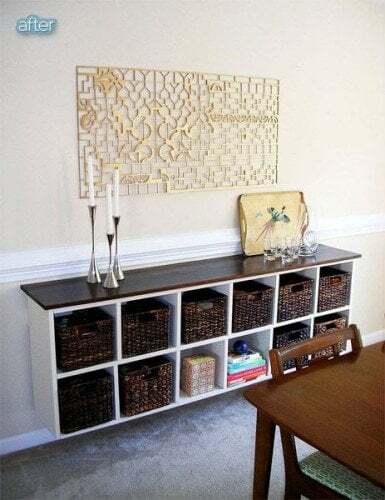 Pieces like a dining room hutch, dining room sideboard, shelving, buffet or dining room server can all display items and keep your dining room organized. They stand against the wall and are generally waist height or lower. 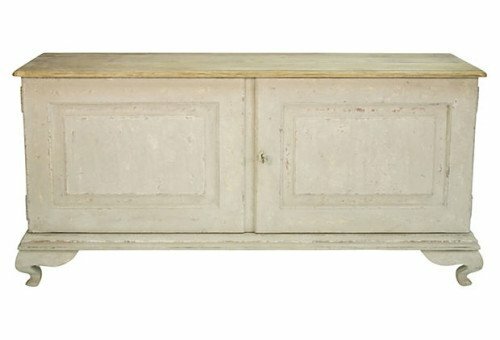 Is there a difference between a sideboard and a buffet? Yes. Sideboards have short legs and even no legs. You will be forgiven if you are using these different words to refer to the same piece of furniture. Once an elaborate piece of furniture a dining room cabinet or china cabinet safely stores all your special-occasion items, clean and ready to use at a moments notice. Glamorous decorative or antique pieces are of course more than storage, they become feature or accent pieces. Do you want a decorative or functional piece? The question is do you want a feature piece or would you prefer to hide your storage? Equally impressive are narrow built-in dining room cabinets. Often low key they are painted the same color as the walls, blending in, seamlessly. This is perfect storage when your dining room is smaller. You can hide your storage and make your dining room feel bigger. Open shelving, glass or opaque doors and you have dining room storage, serving and display unit that suites your home and style. The built-in dining room cabinets above have glass doors, upper and lowers for two sets of closed storage. Painting this dining room china cabinet the same color as the french doors, and door frames, makes the room feel bigger. Replacing your hutch and buffet with built-ins often supplies more storage space for glassware, linens and dishes because built-ins often take the length of the room. Then you can add other display pieces, vases, books, decanters as well as a serving area. Built-ins can be expensive. Get the same effect by adding tall wall cabinets like the one above, painted French gray linen. By painting the cabinet a soft muted color, it blends beautifully with the room and color scheme, while storing and displaying items, keeping them dust free and clean. The piece may not be not expensive, but distressing and aging it and adding new hardware makes a piece like this sing. Even if your piece is brand new pine, you can create something very special for your dining room. One or two of these vertical imposing pieces work wonders as display cabinets. Open shelves often need a little help when displaying items like baskets or trays in the same style to keep order. It both practical and stylish. The open wire and woven baskets in different shapes and sizes above make it easy to see plates and dishes and hide other items, like cutlery, while keeping them easy to access. There are some clever ways to hide you storage, in keeping with the latest minimalist look. Wall-mounted cabinets work well in dining rooms, making your dining room feel open and feeling larger because you can still see the wall. A few select key pieces on your shelves leave the area uncluttered and create a room feature. Wall-mounted shelves are less common than dining room buffets and cabinets but they work well when displaying beautiful china and creamy ceramic-ware. Styling this becomes the main room feature. 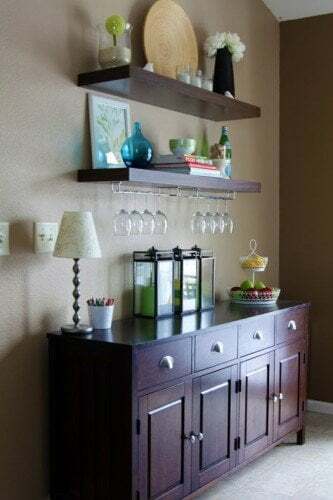 Adding shelves, similar color to the cabinet below, is a great idea; storing glasses under the shelves and making the top sides display areas. This is an inexpensive way to create an area that looks like a unified unit - just by adding similar colored shelves. 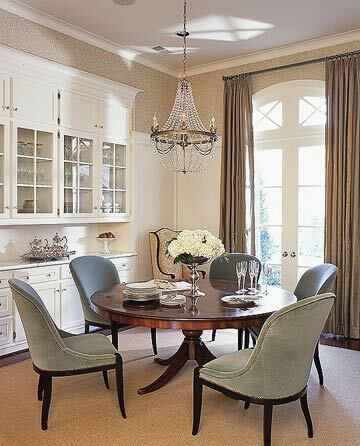 Tall bookcases, or bookshelves, in a dining room, work as a multifunctional storage area. Add baskets to keep some items from view, and leave some shelving areas empty, so shelves look uncluttered. Adding decorative pieces to some empty areas relieves large blocks of books. 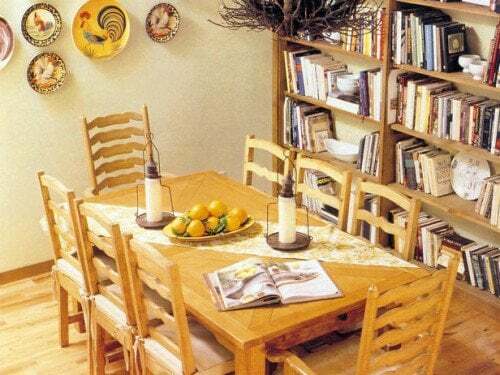 Open storage solutions, like bookcases or shelves means books can site along side dishes and favorite pieces. You can place two tall, thin bookcases on either side of a window or door, or mix it up with shelving and cabinets like the room above. Like floating shelves, a floating storage buffet makes the room appear larger by keeping the floor space clear. This solution can be cleverly made with book cases or open storage cabinets. Again, use baskets to hide, organize and keep things sorted. I like the shelving idea for my dining room - could make a big difference. Its dark - that's my only problem so more furniture won't help. I think I'll paint an old Ikea cabinet and put some feet on it. That could work.. hmm floating shelves on top. Oh, when will I get time? I like the basket ideas - scoop everything out of the way! I love the idea of floating cabinets so I don't spoil my floor - but how do I do it? 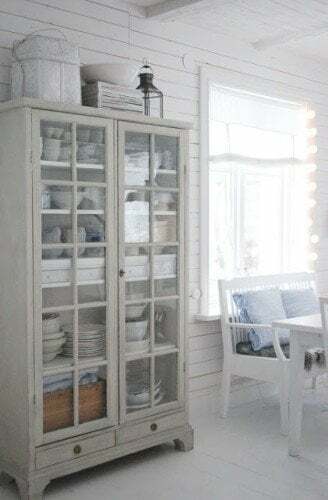 Well, where do I begin... my floors need doing, I need to get rid of 10 years worth of old plates and stuff out of the kitchen first - so I can put things away in a painted cabinet like one of these gorgeous things.. I can't afford to do anything right now but love the ideas! My dining room is so tiny and dark that I need all the help I can get. Painting it gray to begin with..